These were my remarks as a guest speaker in Donna Murdoch's class “Online Teaching and Learning – Applying Adult Learning Principles” this evening. I was asked to speak about learning analytics, but like I said in my keynote last week at NMC, ed-tech is boring. So this is a talk about pedometers. “Know thyself” – this is an ancient maxim, of course. But it’s become not so much a philosophy of introspection or reflection but a compulsion for data collection and data analysis. We now live in a culture of quantification. (We have for a while now, no doubt.) All this is aided today, no doubt, by new computing technologies that create and collect massive amounts of personal data. Learning analytics, in some ways, is a symptom of this data-driven culture – one that also is not new to education. Learning analytics are technologies that support and reflect the idea that we can collect and measure and analyze data about learners in order to know what they know, in order to optimize what and how they learn. I want to invoke the guest speaker’s privilege and talk about something slightly different than what I was asked to speak about: that is, learning analytics. Now, I hope you’ll see that almost everything I say is very much related to learning analytics and to education technologies more broadly – to how we’re asked to hand over our personal data to various hardware and software companies, to our employers, to the government, to our schools under the guise of better “outcomes,” more productivity, and so on. I want to talk a little bit about fitness trackers this evening. “Wearables,” for what it’s worth, were featured in the 2016 Horizon Report for K–12, an annual report that predicts which education technologies are “on the horizon.” The “Quantified Self” appeared on the 2014 Horizon Report for Higher Education. In both cases, the Horizon Report predicted these technologies were four to five years from widespread adoption. You hear these sorts of predictions all the time – that everyone is going to own or use X, Y, or Z technology in the next few years – but according to a recent study, only about 10% of Fitbit owners (and that’s of the less than 12% of US consumers own fitness trackers) are still wearing the device after a year. Like all technologies, fitness trackers have a history – one that certainly predates Fitbit or Jawbone or the Nike Fuelband. There’s some debate about who invented the first pedometer, which remains a core functionality of most activity trackers: that is, counting how many steps one takes per day. Wikipedia lists three possible inventors: Leonardo da Vinci, who sketched the design for a gear-driven device with a pendulum arm that would swing back and forth with every walking leg motion and measure distance traveled; Abraham-Louis Perrelet, a Swiss inventor who built a self-winding watch in 1770 that wound when the wearer walked and then built another device, based on that watch, in 1777 that could measure walking distance; and Thomas Jefferson (Americans do like stories in which we feature prominently in the invention of things, don’t we), who purportedly brought the first pedometer to the US, although it’s not known if he ever improved on the design as he never filed any patents for his inventions. A website that reviews fitness devices also suggests that Jean Fernel, a French craftsman, might have invented the first pedometer in 1525 or Robert Hooke, an English scientist, might have in 1674, or Hubert Sarton, another Frenchman, might’ve in 1778. It was John Harwood, a British man, who was awarded the first patent for a pedometer in 1924. So even if we date pedometers from that patent, we’re still looking at about 100 years of history; if we credit da Vinci, we’re looking at about 500 years of pedometers. Now, it’s worth asking why so many inventors have been interested in the pedometer concept. For these men I’ve just named, at least, their interest was not in improving “fitness” per se but in measuring distance. For da Vinci, the device had military applications; he also imagined it would help improve mapping. 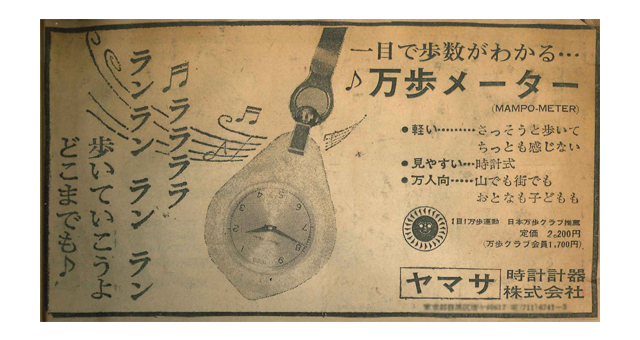 The promotion of the pedometer as a fitness device started in the 1960s when Dr. Yoshiro Hatano, a professor at the Kyushu University of Health and Welfare, undertook some applied research into exercise and calories. Concerned about the rise in obesity in Japan and wanting to promote and reinforce daily activity as part of “good health,” Hatano began selling a device known as “Manpo-kei” – the 10,000 steps meter. Hatano had calculated that the average Japanese person walked about 3500 to 5000 steps a day. By increasing the number of steps to 10,000 (roughly 5 miles), the amount of calories burned obviously would increase as well – up to about 500 calories a day, which could translate into about 20 kilos of weight loss in a year, he claimed. 10,000 steps was, according to the marketing for the Manpo-kei, ideal. There are plenty of reasons to question that claim. 10,000 steps is less some medically-advised threshold than it is a marketing gimmick. Hatano could have picked 7500 steps or 13,333. 10,000 steps is a nice round number, one that will take you about 100 minutes of moderate activity to accomplish – but it’s also an arbitrary number. 10,000 steps is a goal that’s based on a lot of assumptions about bodies and activity and physical ability too. Nevertheless the number – and the connection between “steps” and “fitness” – has stuck with us for 50 some-odd years now. 10,000 – that’s the goal that almost all fitness trackers set for us. Surprise, surprise. They’re far from perfect. It depends on where you wear the device – on your wrist, in your bra, in your pocket, in your purse. It depends on what kind of activity you undertake. A study published in 2013 found that these devices tended to underestimate the energy expended while standing or bicycling or jogging uphill. And it depends on the device, the brand. A recent study from Stanford found that six out of seven wristband activity monitors measured heart rate with an error rate of less than 5%. Not too bad. But none of these monitors measured energy expended – a.k.a. calories – accurately. The most accurate fitness device was off by an average of 27%. Off, in other words, by roughly one McDonald’s Cheeseburger. These errors are pretty important if you’re making decisions about your diet based on the data you glean from your fitness tracker– like should you have a McDonald’s Cheeseburger or another glass of wine. These errors are really important if someone else is making decisions about you based on this data – like your employer deciding whether your participation in the company wellness program is adequate. Or your health insurance company deciding whether to deny you coverage based on your physical activity or lack thereof. Or your school tracking how much you exercise and what you eat and how much (and where) you sleep and giving you a grade for it. Oral Roberts University, for example, beginning in the spring of 2016, encouraged its incoming students to wear a Fitbit and urged them to log their personal data in the learning management system. Are these examples of “learner data”? They’re certainly examples of “student data,” right? Whose data does the data collected by a fitness tracker belong to? What do the Terms of Service say? (You’ve read the Terms of Service, right?) What else, in addition to how many steps a wearer has taken in a day, do these devices track? What does the fitness tracker maker use this data for? Who does the fitness tracker maker share the data with? Who does the fitness tracker maker sell the data to? How long does the company retain it? Can a user request a copy of their data? Can the user delete it? These aren’t medically-approved devices, of course, but what is being collected is, no doubt, sensitive health data. Is that data safe, secure, private? Are there any legal protections regarding this data – that is, does it count as part of someone’s “medical record”? What are the implications when we compel people – through health insurance or through employment or through the learning management system – to be monitored in this way? The marketing tells us that this sort of tracking should be done for our own good, for our health and well-being. We should want to track and be tracked. The science? Well, the science, not so much. Indeed, one study published last year in the journal of the American Medical Association, found that those who wore fitness trackers lost less weight than those who did not. Yes, that’s just one study. I hear a lot of people say – anecdotal data – that they like their fitness tracker because it motivates them to move. They say they like the “gamification” of exercise – earning points and badges, sharing their efforts via social media, and so on. They insist they need this extrinsic motivation as their intrinsic motivation simply isn’t enough. Not 10,000 steps worth of enough, that is. And Americans have been tracking calories for quite some time now. Again, there’s a history here – why the calorie is the unit of measurement. Like the invention of the pedometer, there are many origin stories we could tell here – the development of the science of human nutrition in the early twentieth century. 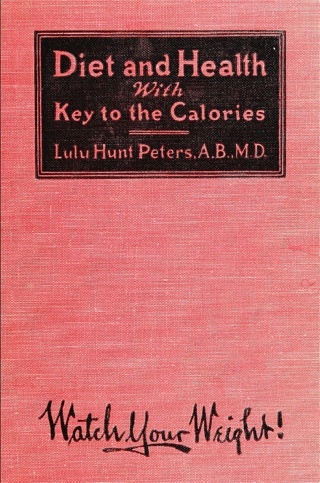 I’ll give you one name (because I’ve only mentioned men so far): Lulu Hunt Peters, an American doctor, who published the bestselling diet book Diet & Health: With Key to the Calories in 1918 and who popularized the idea that if you counted calories, you can lose weight. 500 years of pedometers. 100 years of counting calories. 50 years of connecting “steps” and “fitness.” Today’s fitness tracker isn’t new, but rather fits quite neatly into a long social and technological history. We are very accustomed to the stories about measuring these data-points for the sake of our personal health and well-being. There’s a cultural logic to the fitness tracker. Is this meaningful data? Are “steps” or “calories” meaningful units of measurement, for example? What can we truly know based on this data? Are our measurements accurate? Is our analysis, based on the data that we’ve collected, accurate? What sorts of assumptions are we making when we collect and analyze this data? Assumptions about bodies, for example. Assumptions about what to count. Assumptions and value judgments about “health”. How much is science, and how much is marketing? Whose data is this? Who owns it? Who controls it? Who gets to see it? Is this data shared or sold? Is there informed consent? Are people being compelled to surrender their data? Are people being profiled based on this data? Are decisions being made about them based on this data? Are those decisions transparent? Are they done via algorithms – predictive modeling, for example, that tries to determine some future behavior based on past signals? Who designs the algorithms? What sorts of biases do these algorithms encode? How does the collection and analysis of data shape behavior? Does it incentivize certain activities and discourage others? Who decides what behaviors constitute “good health”? Those are questions we should consider regarding fitness trackers, sure. But they’re questions for all sorts of technologies – education and otherwise. Is this meaningful data? Are “test scores” or “grades” meaningful units of measurement, for example? What can we truly know based on this data? Are our measurements accurate? Is our analysis, based on the data that we’ve collected, accurate? What sorts of assumptions are we making when we collect and analyze this data? Assumptions about bodies, for example. Assumptions about what to count. Assumptions and value judgments about “learning”. How much is science, and how much is marketing? Whose data is this? Who owns it? Who controls it? Who gets to see it? Is this data shared or sold? Is there informed consent? Are people being compelled to surrender their data? Are people being profiled based on this data? Are decisions being made about them based on this data? Are those decisions transparent? Are they done via algorithms – predictive modeling, for example, that tries to determine some future behavior based on past signals? Who designs the algorithms? What sorts of biases do these algorithms encode? How does the collection and analysis of data shape behavior? Does it incentivize certain activities and discourage others? Who decides what behaviors constitute “a good student” or “a good teacher” or “a good education”? Are learning analytics (or fitness trackers) a way one can “know thyself”? What do we think we know, based on them?